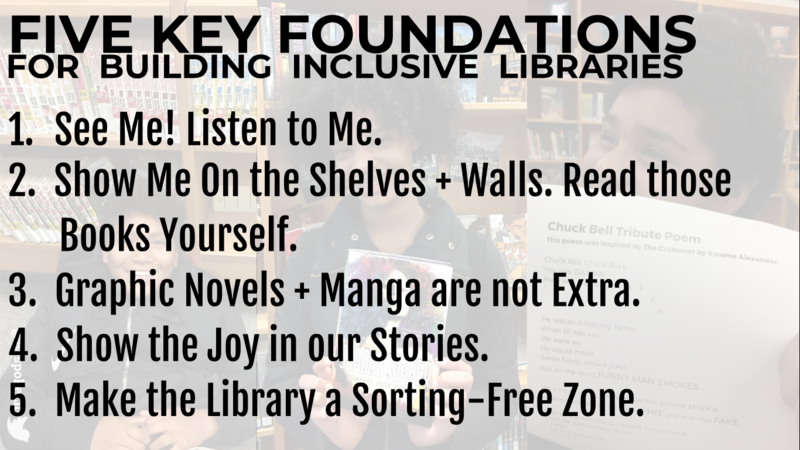 Is there anyone more equipped to meaningfully speak on the concept of inclusive libraries than our students or patrons? Of course not. Of course not. 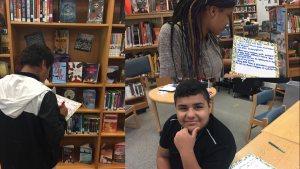 To leverage students’ experience, perspective, and wisdom—and to create student-driven PD—I worked with three of our amazing 8th grade students at Mount Vernon Middle School to develop student-led training for librarians. 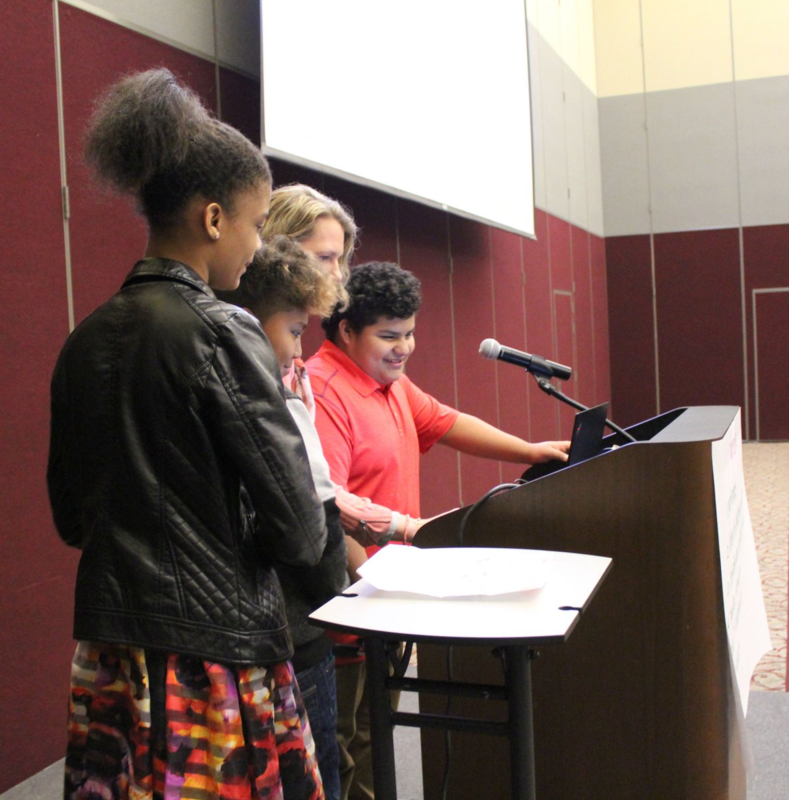 In April of this year, Jaida Morris, Cesar Falcon, Jose Gomez and I unveiled our #LibFive concept—Five Key Foundations for Building Inclusive Libraries—at our district conference, WCPSS Convergence. Several weeks ago, I was lucky to share our ideas at ALA’s National Conference during the YALSA Presidential Program, a Panel on Youth Activism. My students and I continue to work on crafting this professional development, but we’d like to share the work that we’ve already completed in this forum. Our project was based on an initiative from the Chapel Hill Blue Ribbon Mentors called the Student Six, which is a student led professional development for teachers centering on six culturally sustaining strategies for educators to use to better connect with their students of color. I had seen the wonderful teens and educator Teresa Bunner presenting on the Student Six and each time, a question came up from the audience of mostly librarians. [You can probably guess what it was.] What was your experience with school libraries? Well, the answers were lukewarm at best and none of the teens in attendance had meaningful, positive stories or experiences with their school libraries or librarians. Which was, and is, heartbreaking. Sitting there, I thought: we need an equivalent for libraries. 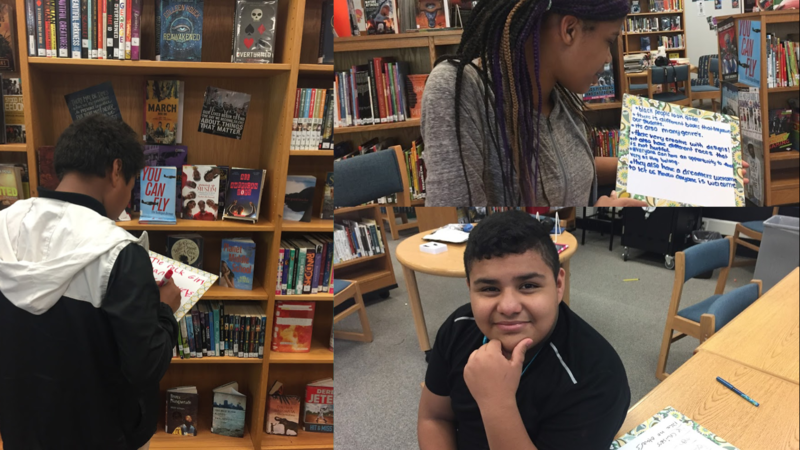 I want to hear teens talk about these ideas—with the specific lens of LIBRARIES. Someone needs to do this. Then, I thought, well, why not us? Our wonderful students have experiences with multiple schools—schools where they were not finding success, and they are able to come to Mount Vernon and rewrite their school stories. Part of that rewriting naturally happens in the library. To prepare for building this library professional development, Jaida, Cesar, and Jose eagerly learned about research that directly related to our topic. We began with Dr. Kafi Kumasi’s research (2012) which found that many students of color felt like outsiders in their libraries and that it often seemed like a place that was ‘owned’ by the librarian. As a foundation for thinking about libraries and students of color, we also looked at the powerful Hanley and Noblit study (2009) which found that for youth of color, positive racial identity leads to academic success. 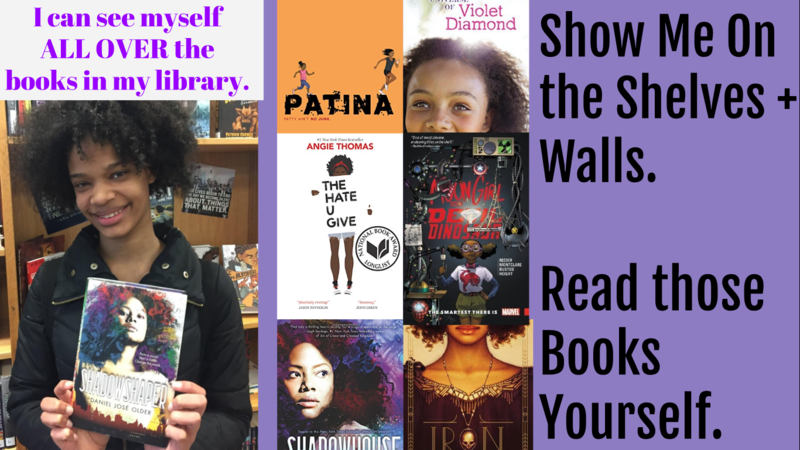 From there, we moved to unpacking the state of representation in books today and discussed #ownvoices, counterstories, and the necessity of building reflective collections. Jaida, Cesar, and Jose then learned more about the Student Six. We dove into the six strategies and watched videos of the student trainers Erika Franco-Quiroz and Jotham White talking about their experiences. See me! Listen to me. Show me on the shelves and walls. Read those books yourself. 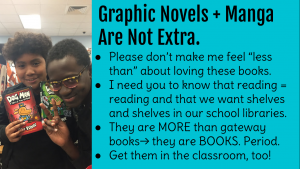 Graphic Novels and Manga are not Extra. 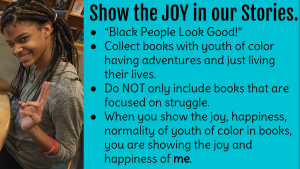 Show the joy in our stories. 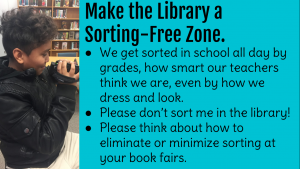 Make the library a sorting free zone. These ideas might seem obvious or too simple, but I would implore those thinking along those lines to think again. They are powerful due to their simplicity and when done well, can result in empowering library programs. Jose: See me! Listen to me. Greet us. Be excited to see us. At my last school, no one ever smiled at me when I came in the library. Learn our names. Say them correctly. Find out what we’re interested in. 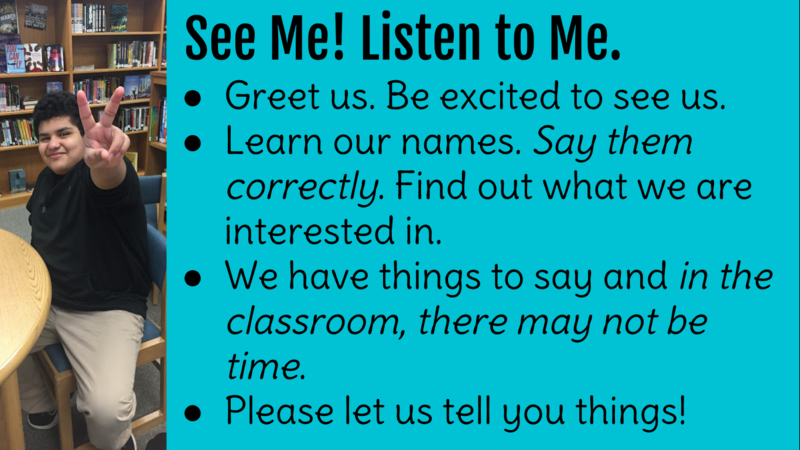 We have things to say and in the classroom, there may not be time. 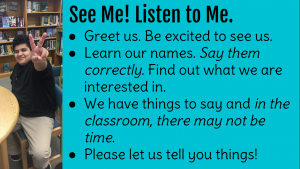 Please let us tell you things! This quote shows this foundation, too. For voice to be meaningful, there must be those willing to listen. Jaida: Show me on the shelves and walls. Read those books yourself. I need to feel wanted, welcomed, and seen. That is NOT possible if I don’t see myself in library displays and on the shelves. 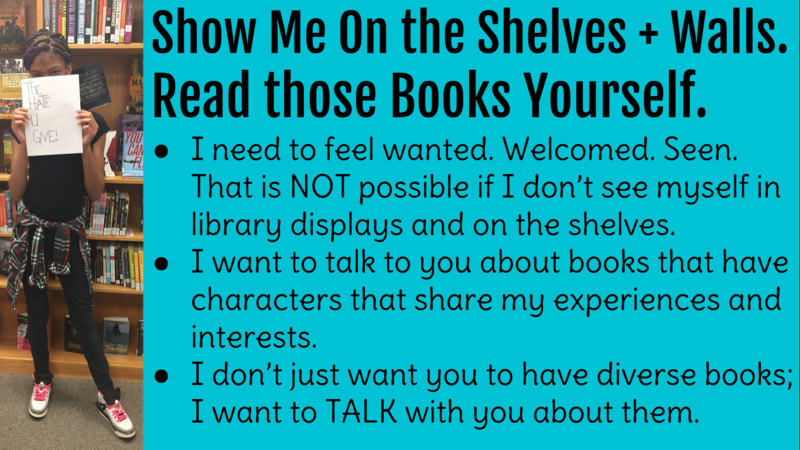 I want to talk to you about books that have characters that share my experiences and interests. I don’t want you to only have diverse books. I want to TALK with you about them. I can see myself ALL OVER the books in my Mount Vernon library. I love these covers. They are so beautiful! Ce sar: Please understand how much I love these books. They are NOT less important than other books. 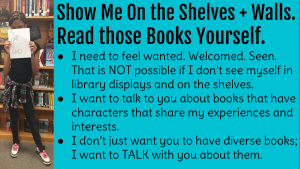 Reading equals reading and we want shelves and shelves of these books in our school libraries. They are MORE than gateway books, they are BOOKS. Period. Please get them in the classroom, too, so they are used during lessons like they are here at Mount Vernon. Jaida: Black People Look Good! We did this exercise in the beginning of the year and I was writing down things about my Mount Vernon Library that I liked. This was the first t hing I wrote. I wrote it because I could look around and see covers that didn’t just show black people dealing with slavery or civil rights, but just beautiful covers with black people living happy or interesting lives. 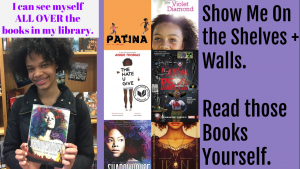 Collect books with youth of color just having adventures in the present day and in the future. Do NOT only include books that are focused on struggle. 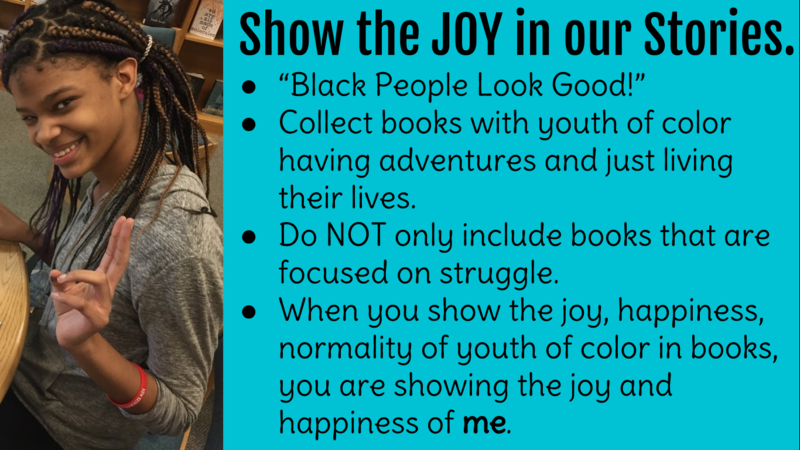 When you show the joy, happiness, and normal lives of youth of color in books, you are showing the joy and happiness of me. Cesar: We get sorted in school all day by grades, how smart our teachers think we are, even by how we dress and look. Don’t sort me in the library! 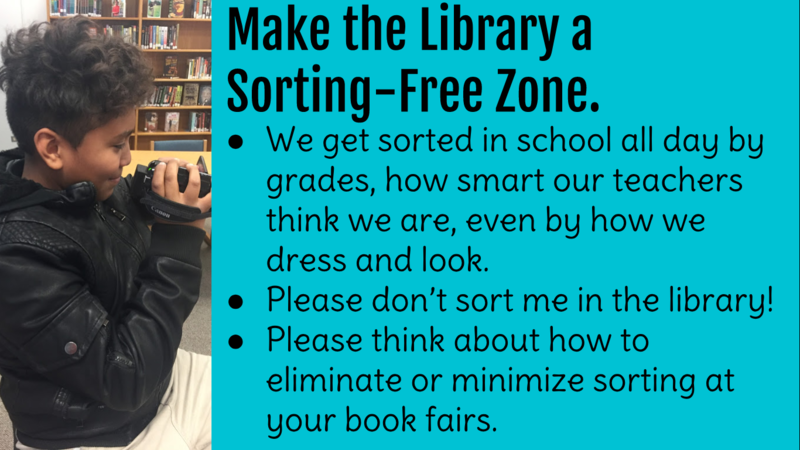 Please think about sorting at your book fairs. Let’s hear what some of my classmates have to say. I always felt like the librarian at my old school gave me and my friends this look when we walked in. Like this evil kind of stare. Like she had already decided something about us. This one year, my teacher stopped at the book fair for us to buy books on the way back from lunch. If you had money with you, you got to shop at the fair. If you didn’t you sat on the floor in the entrance to the library. Our classmates came back with bags of books and we just sat there on the floor, waiting. I never had money to buy anything at the book fair so I couldn’t get anything. It didn’t feel right to be in the library and not be able to get books. Jose: These reasons help explain why we love our library so much. 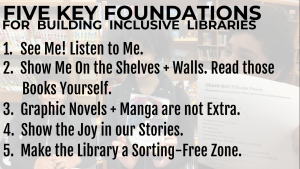 We want every library to also do these five things really well. Thank you! See? I wasn’t overselling my students when I called them amazing. I’m on Twitter at @BespokeLib. Thanks for listening! 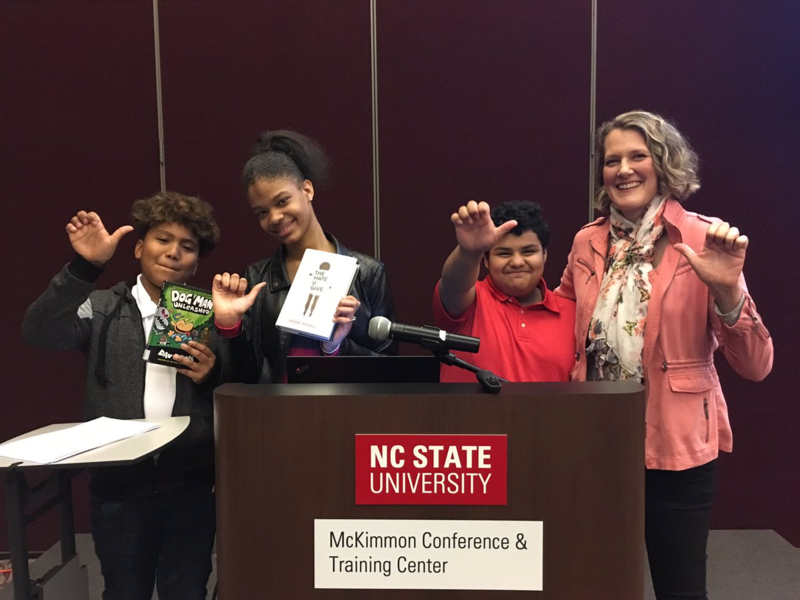 Julie Stivers is the librarian at Mount Vernon Middle School, an alternative public school in Raleigh, NC. Bunner, T. (2017). When we listen: Using student voices to design culturally responsive and just schools. Knowledge Quest, 45(3), 39-45. Hanley, M., Noblit, G. W. (2009). Cultural responsiveness, racial identity and academic success: a review of literature. Prepared for The Heinz Endowments. Kumasi, K. (2012). Roses in the concrete: A critical race perspective on urban youth and school libraries. Knowledge Quest, 40(5), 32-37.